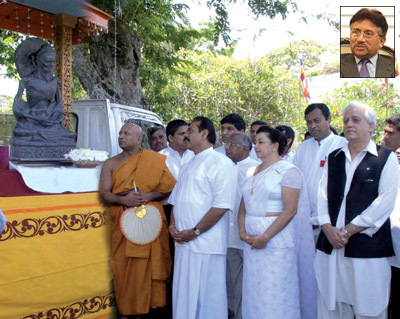 Bashir Wali, High Commissioner of Pakistan donated a Buddha statue from Pakistan of the fasting Buddha to President Mahinda Rajapakse at Temple Treees on Vesak day. President Rajapakse handed over the statue to Ven.Dr.Kollupitiye Mahinda Sangharakkhita Thera,Chief incumbent of the Kelaniya Rajamaha Viharaya. First Lady,Shiranthi Rajapakse was also present. Picture by Sudath Silva. Inset: Pakistani president Pervez Musharaff. The United States on Friday condemned an attack on a Sri Lankan naval vessel by separatist Tamil Tigers, warning the violence risked returning the South Asian island nation to civil war. Head of the Sri Lanka Monitoring Mission, Ulf Henricsson yesterday assured the government that the SLMM was planning 'fresh' arrangements to continue sea monitoring and dismissed reports that there was a total pull out from monitoring sea activity. TALKING POINT : Live and let die! 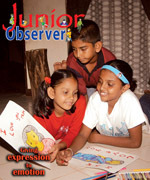 Can specs give sight to blind elephants?